Display cabinets are great pieces to add storage and style into your home; our beautiful solid oak units are ideal! High quality in several different finishes. 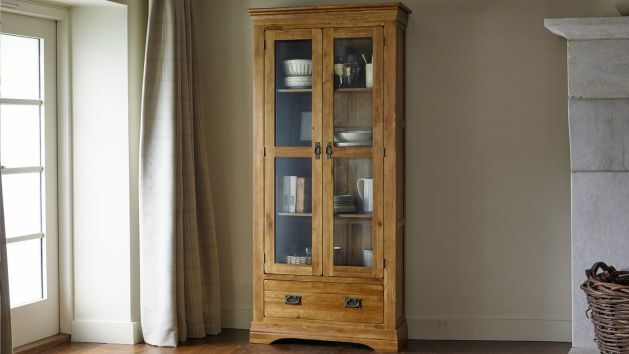 We have a great range of solid oak display cabinets which let you add storage and style into your home. Ideal in the living room or dining room, these units feature thick solid oak shelves, glazed doors and often drawers for hidden storage. We offer display units in both a natural and a rustic wax finish. The natural finish is designed so the bright oak tones shine, allowing the unique wood grain patterns to stand out giving each piece a unique character. The rustic finish lends a darker, honey coloured look to the cabinets for an aged, country feeling. Many different styles are available, from the simple and modern, to more traditionally styled pieces, so you are sure to find the ideal look for your living room or dining room. Browse all our great display cabinets today!